This year I am the Case Manager for four 504 students. That means I keep track of student 504 meetings, reporting student needs to teachers, communicating with parents, and basically keeping up to date with what is going on academically with these students. 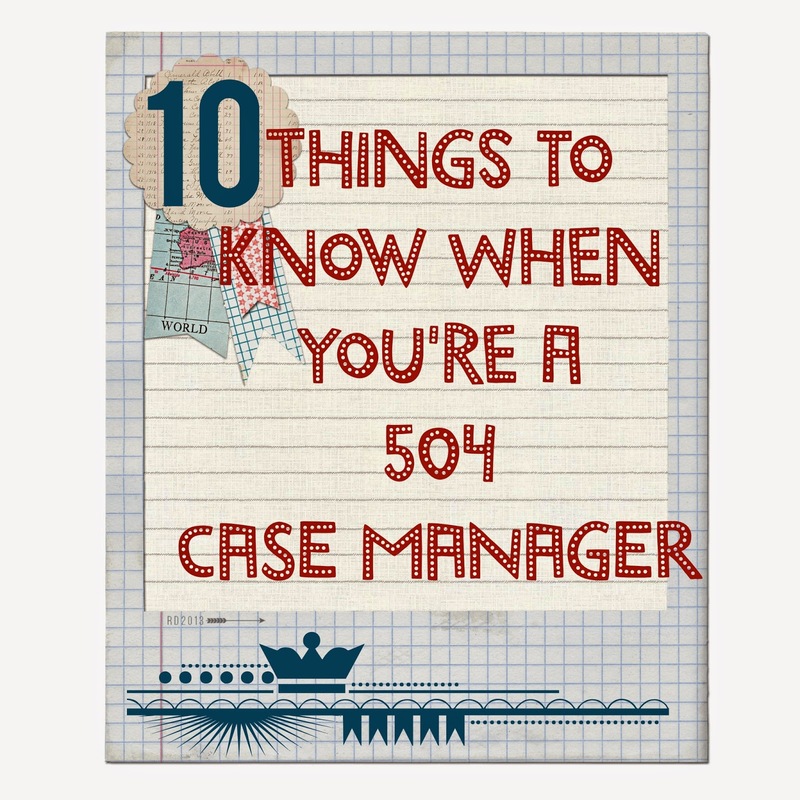 Here are some things to do when acting as a case manager for a student with a 504 plan. 1. Review their 504 plan. Note things like special alerts, the determining factor (the disability) for their 504 plan, Their program (classroom) accommodations and testing accommodations. 2. Make a cheat sheet for teachers that they can keep as a go to guide. Here is one that I created. 3. 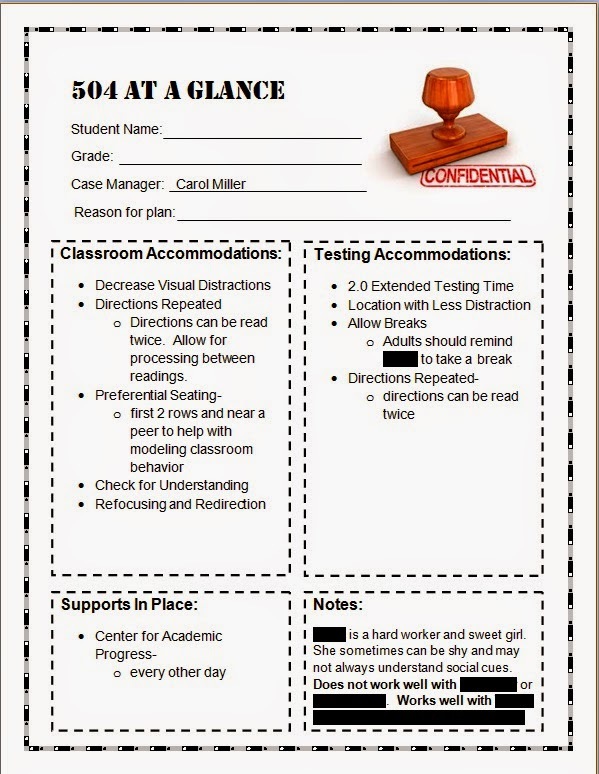 If they have testing accommodations, make sure they have a copy of the 504 plan in your school testing room. In our school we have a staff member who mans this room all day long to provide testing accommodations for students. 4. Know when the annual meeting date will be. 5. Set up any parent meeting that may be written into the 504 plan. Even though this is only our second day of school, we already had 2 parent-teacher conferences so parents could share with the teachers helpful tips about their children. 6. Be aware of any special services a student may receive--speech services, use of scribe, use of iPad, OT, PT, counseling, etc. 7. Keep in contact with parents. I am planning on reporting to parents every two weeks with a check in of how classes are going, upcoming assignments parents should be on the lookout for, questions or comments from the teachers that they would like to share, etc. 8. Keep non core teachers in the loop. For those teachers that are not a part of a team, but work with your students, make sure you distribute and gather info from them as well. For our school this includes our PE, health, and AIS teachers. 9. 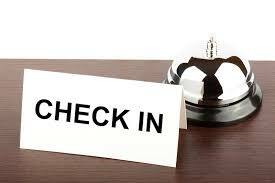 Check in periodically with your students. See how things are going. Ask them about their classes and how they think are doing. Don't forget to review report card grades, as well as attendance and behavior reports if necessary. 10. Keep a folder for each student and keep copies of all notes and reports that you send or receive in case you need to refer back to them. 11. Enjoy being the case manager. This is an important role and you can have a significant impact on a student and their overall school progress. Keep positive about your assignment and positive things will happen. I read parts of your blog and i really liked it! would you consider writing about eliademy.com? Our service is free online learning and management platform with private video students and teachers. It is a great tool to spread and share knowledge with and adaption and development form the everyday online course. Eliademy serves as great contribution to the 21st century classroom. I love this 504 at a glance sheet!! I am a middle school social worker in NYC and think that our school can really benefit from utilizing this type of sheet. Is there any way you can email it to me in a .Word or some other type of file in which I can alter it?? I love the at a glance sheet! Could I get a copy of this? becky.schnabel@sendt.nodak.edu Thanks! We have a son on a 504. We recently had a meeting for the 504. Last year it was cancelled from the weather and never rescheduled. Finally, NOW, it's all a buzz. I scheduled a PT conf. so that all the teachers would be more cohesive. The counselor attended, and thankfully so, because she defended my son's situation. The teachers were really pursuing the "irresponsible kid direction..." Well, yeah... he's 12. You starting this at the beginning of the year should be the goal for every school. We are now at the middle of the school year, fast approaching state testing. It's crazy to have to argue about scribes and enlarged papers... It's in the 504. Frustrating! I would love a copy as well please! This would be so helpful!! Thank you! This sheet looks great! I am the 504 Coordinator for my school. I would love a copy. Thank you! I really like the title of your blog "The Middle School Counselor"
This brilliant must-read article provides the key to the School testing room, Teachers helpful tips, Irresponsible kid direction & Fast approaching state. Carol Miller you raise a powerful antidote to today’s malaise and pessimism. Anyone who chooses Case Manager has to be comfortable with School testing room, Teachers helpful tips and Irresponsible kid direction. Top-notch people skills don’t hurt, either. Hi Carol! This is great! We would like to implement this system at our school as well. If possible, could you send my a copy of the "at a glance" form? Thanks for all you do for the profession! oops..my e-mail would probably help, right? :) epaulson@westlakeacademy.org. Thank you! I love this sheet! Could you email a copy to smscyberteacher@aol.com? Wow! What an interesting post. I like this site very much. Thank-you for this 504 information. I will be involved with 504 planning as a first year counselor I would appreciate the "504 at a Glance" sheet as well if you are sharing. Thanks! This 504 form is excellent. I tried looking elsewhere, but I did not like any but yours. Would you mind sending me a copy? hvandyke@bethelsd.org. Thanks so much for all of your great ideas and post! Truly helpful! chung cư hoà bình green city mãn, mật độ tuyệt đối vượt qua ma tinh! - Không! Thiếu gia, đó là những thứ còn lưu lại trong bình chưng cất! I would love a copy of this 504 at a glance form too. Can you send it to me at tonirobinson6@aol.com please? Thanks!! Hello, I'm a first year counselor. I would love to have a copy of the 504 at a glance form. Please send it to knewhouse@ymail.com. Thanks in advance! Could I have a copy of the 504 sheet? Love the format and idea. THanks for sharing. Hello, I would love to have a copy of your 504 Sheet to use in my classroom, if you don't mind. Thank you for sharing. A great big thank-you, the material is really worth the salt! I can see that the author is talent in the specialty area. In contrast to great many pieces of writing I've looked through on the matter, the one has new thoughts. The website actually assures a number of entertaining pieces of writing on the current questions. My friends and I skim them on a constant basis. Please share the template? kspippenger@aps.k12.co.us. Thanks for sharing your wise words and awesome resources!! grasielajohnson@gmail.com. This can definitely help me. Hey! I love your 504 At a Glance! This is my first year as a 504 case manager. This would be a tremendous help! Would you mind sending me a copy to my email address? My email is rfarley88@gmail.com. Thank you so much!! Love it! Can you please email it to me at eesweeny@gmail.com ? Thank you! In the lunch room I had reserved seating. The kids really felt special having their own space. Nursing Assignment Writing Service for your writing help. Hello, I am a school counselor and section 504 coordinator/case manager. Can you please share the cheat sheet. It is awesome! Thank you! This is very much a work in progress whenever I find out about one who is more beautiful than any of these I will add her http://awriter.org/ and kick out number ten Thanks for sharing the informative post. I would like a copy as well! msjenn2010@live.com. Thank you! I would love a copy of this 504 cheat sheet as well. I would love a copy of the 504 at a glance.